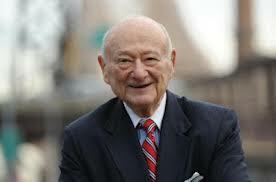 The former mayor of NYC, Ed Koch passed away today. He was 88. Pastrami, Dijon, Swiss, tomato and roasted red peppers. While it won’t be like a deli sandwich from Katz’s or the Second Ave. Deli we are confident that you’ll like it and it won’t cost $20.00 either! We’ll miss you Mr. Mayor.